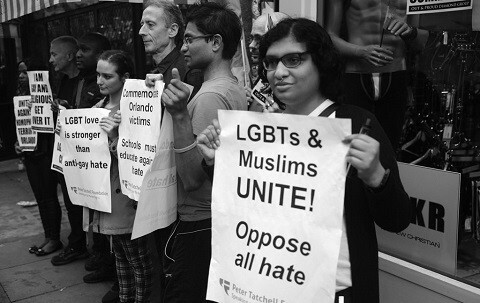 A recent survey has found that American Muslims are now more accepting than white evangelicals of LGBT people. Conducted between January and May of this year, 52 percent of Muslim respondents to the Pew Research Center survey said that homosexuality should be accepted by society. This is an increase of 25 percent since 2007. However, only 34 percent of white evangelical Protestants said they believe homosexuality should be accepted. This is the smallest percentage of any group surveyed. Within the U.S. Muslim community, women and college graduates had the highest acceptance rate of homosexuality (both 63 percent), followed by less religious Muslims (62 percent) and millennials (60 percent). While results found that acceptance of homosexuality in the U.S. Muslim community corresponds with wider acceptance in the U.S. general public, there remained generational differences in acceptance within both populations. Researchers found younger U.S. Muslims are more accepting of homosexuality than their older counterparts. Within the U.S. Muslim community, 60 percent of millennials said homosexuality should be accepted in society — 14 percentage points fewer than the general millennial population in 2016. In contrast, the U.S. Muslim “Baby Boomer or older” demographic had a 42 percent acceptance rating of homosexuality in 2017, 11 points lower than the general population’s acceptance rate around the same time. Additionally, the survey found that white mainline Protestants have the highest acceptance rate of LGBT people, with 76 percent saying it should be accepted by society. Read the survey results below.